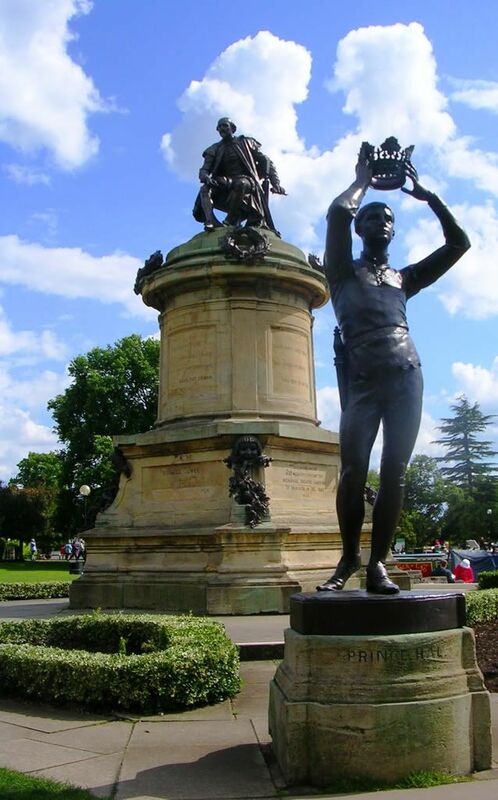 Etched into Shakespeare's memorial in his home-town of Stratford-upon-Avon [pictured], the familiar words reminded me of a fine piece I'd recently read by Mike Shichangpu, on the subject of loss. As I looked up and down Stratford's old High Street, it seemed poignant that not even the Bard's ancient home-town could avoid its own special form of demise, and loss of its own. My last visit to Stratford was over a decade ago, as a Fresher. Being an irresponsible eighteen-year-old, I had spent my entire second term's bursary on a birthday trip for my girlfriend of the time to a beautiful 15th century hotel. The town was small, gentle, and filled with old bookshops - time had passed slowly since Shakespeare's age. The Stratford of my memory appears to be no more. Where once quiet lives were led in peaceful isolation from the rest of the world, now is covered in concrete pathways (to withstand mass tourism), counterfeit "olde shops", and outlets of multinational coffee-shop chains. 100% of the accents I heard in the streets were American, oddly enough. Stratford's hour upon the stage is definitely heard no more, and the words of Mike's article rang true. All that remains here is a theme park - it reminded me of the Forbidden City. However, every cloud has a silver lining. What the centuries could not do to Stratford, modern capitalism appears to have achieved in a decade - but one pleasing side-effect is that one in every three shops sells "Tea". Most of these are insulting to anyone with even a modicum of taste, but it is these that tend to do the best business with the visitors to the town. However, as is true of most things in life, the best tea shops do not shout about themselves, and merely exist in all their rustic finery, resting quietly in their own natures - ignored by the masses, patronised by the few. These silent beauties do not exhibit gaudy plaques advertising dubious claims to antique histories. They do not offer "real British teas" (we seldom use the term "British" for anything). They very definitely do not name items on their menu after Shakespeare ("The Shakespeare Club Sandwich"). Discreet service, hushed tones, and centuries-worn interiors instead await those willing to leave the crowds behind and venture inside. You won't find 30s pu'er (unfortunately), and you won't find fresh Qingming greens, but you will find a comforting Afternoon Tea served with the usual complement of irregularly-shaped, still-warm scones and enough cholesterol-loaded cream to scare away those tiresome sorts for whom life is a health regime, not a pleasure. My thunderous brow and ringing ears gradually eased, in quiet conversation with my companions who looked similarly affronted by the modern Stratford. For all that I dislike tourists, the irony that I am one of them is not wasted on me. As yet another coach-load of visitors arrived, I sat in a doorway with a little daschund [pictured]. He oozed quiet wisdom, regarding everything around him with the cool regard of a seasoned Zen master. I gave obeisance to his silent teachings by scratching his ears. What manner of tea can make up for such woe? The Hengkang Factory "Chawang" [Tea King] is made for the large Hengfu Tea Company. Like most of their products (such as the Laohei), this one looks pretty, if nothing else. 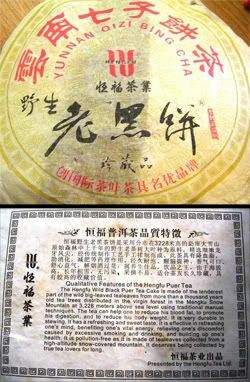 It comes with its own series of "passports": laminated cards giving pesticide and fertiliser levels in the tea, compared to Mainland-recommended limits. Indeed, these can be easily fabricated, and the actual numbers may mean little in themselves even if accurate, but they represent an acknowledgement that such matters are significant - which is surely a step in the right direction. We received this from the dealer that we visited in Chengdu. Long, loose, luxuriant leaves [pictured]. Inner bing leaves are noticeably higher in compression, and perhaps smaller. The tips, however, are all in the outer shell. The reassuring aroma of wood-sap is about the leaves. Orange soup, which seems bright. It is slightly opaque with tip-fur suspended in it. THe beidixiang is smokey, with plenty of young shengpu energy. This is a touch overbrewed, and needs shorter infusions to avoid the potency that this tea can happily deliver in excess. Decreasing the strength removes the smokiness, with a long and sweet lengxiang that lasts for at least five deep breaths. The flavour is sharp and straight from the outset. The punch of the youth is coupled with a decent grain-like aftertaste that I find enjoyable. The body is full, and this bodes well for its future. Freshness and power are evident in abundance, and the huigan makes the mouth water. Generally small and whole with good strength - they seem healthy. The solid colour is reassuring, given recent forays into red-oxidised pu'er. Not outstanding, but potent with some surrounding character that could indicate potential storage benefits. The huigan is sweet and pleasant, and I enjoyed the finish in the nose. CB was kind enough to provide comments for this tea, noting a good coating in the mouth, but with the lingering bitterness that sits in the throat. She found the smokiness to be more obvious, and detected some jasmine-floral finishing touches that eluded me. When I took these notes, I didn't comment on the chaqi, but CB notes it to be strong, if short-lived. I admire the presentation and appearance of the cake; it's not one to enjoy now, so let's see how it changes over time. 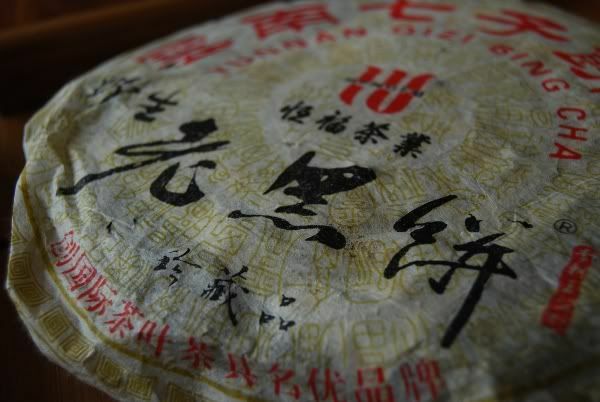 Hengfu products are definitely catering to the newer pu'er lovers in the world. If they can back up their chemical analysis of the organic nature of the tea processing with some sort of status guarantee, I would be more likely to give credence to the unusually high-quality "passport" documentation that was included with this cake. They look pleasant, but do they carry any real meaning? 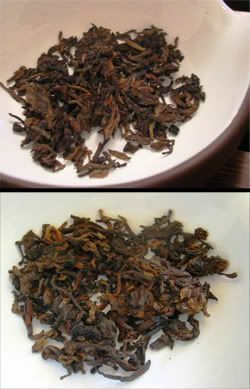 Courtesy of MarshalN, I've been drinking two mystery pu'er - results to follow once the event is completed. Have a great week-end, and enjoy your Bank Holiday if you're in the UK. As yesterday, these samples will remain anonymised until all results are in. I am planning to publish the conclusions of the event next week-end, and so for those few tasters left yet to taste, do send your notes by then if you'd like them included (but do not feel obliged to do so). Long, whole leaves, with a large number of yellow (usually suspicious) leaves. A nondescript aroma of generic pu'er lingers. The compression is very loose, almost maocha. I found the leaves' appearance rather pretty - what say you? You may note just three infusions were made - not a favourable sign. The initial infusion had a sticky, sugar lengxiang which rapidly vanished in subsequent brews. This leaf tastes very young, with plenty of ku from the mid-taste onwards to the throat - this lingers, but there is little patience in the fragile, quiet sweetness that constitutes the flavour. The ku is strong in later infusions, almost becoming raggedly so - like a speaker turned up louder than its quality can handle. Hand-picked, whole, and pleasant. Some red edges from bruised leaves. Very green. Thin and not very interesting, this tea was at least energetic - my arms and throat flushed with warmth. There was little flavour, complexity, or presence to arouse my attention. Dark and matted. Broken leaves of all grades. This does not bode well. A murky, yellow soup. The wenxiangbei is interesting, opening with something like the contents of a stable (sharp, deep straw), and ending in a sickly-sweet lengxiang. More drinkable than D, this had a tang running through it similar to artificial sweeteners - something edgy, like saccharin. No huigan to be found, nor presence in the nose, this tea is muted in all ways. It is a harmless background tea while I unwind with "Blood On the Tracks". The final infusion was a failed attempt to coax out some flavour, which seems to be largely absent. Plenty of stems, with a mess of broken sections, from many sizes. Drinkable, and yet so bland that I found my mind wandering away from the tea-table. I detect no character of yesheng [wild] leaves. This tea has prejudiced me against Jiangcheng factory, of which this is their first product I have encountered. Looking somewhat akin to a Wuyi yancha, it is twisted and dark. It has the gentle aroma of nothing in particular. The soup was a strong orange, initially causing concern of overbrewing; however, the taste was very quiet. A little tanginess, but a truly noteworthy absence of absolutely any else: no huigan, no patience, no nose, no sensation, no flavour, no chaqi. It is a warm cup of "something", after many hours spent with research. VL's kind provision of the Fratres by Arvo Part rings out the death-knell for this tea. Rather pretty little leaves, like nettles. They are very pale, which perhaps explains the lack of detectable characteristics in this tea. Apart from a monotonic, constant ku, one could be forgiving for thinking that they were drinking warm melon juice. This is the product of over-farming, and I would very much like to sit down with the farmers responsible and have them drink their own tea. The high price of maocha has led to many ills, and teas like this are certainly among them. These tasting notes will be initially anonymised to "A", "B", and "C" according to the samples, and updated to the actual names of the shupu once everyone has finished their tasting, and returned their notes to me. I shall summarise the notes of the various entrants in a separate article, once all have been received. Response for these three shupu samples has been largely negative-to-average so far, and so I'm keen to find out for myself - attempting to remain unprejudiced and fair. A tiny insect crawled out of this sample as I poured the leaves into the chahe - a tiny mite. Eyebrows raised, I consider the leaves - as you can see, they're quite unorthodox, being big and flat, and almost rolled. The aroma is damp and sweet, like old water. Alarms bells are ringing. I chuckle aloud as I remember an e-mail from a particular taster, who shall remain nameless, wondering if this tea was safe for consumption. The insect certainly thought so, at least. No aroma in the wenxiangbei, just warm air - not a great sign. The leaves in the pot smell of mould-spore. This is, similarly, a bad omen. Almost no flavour exists in the first infusion, with some damp fustiness in the nose. The second infusion yields an aroma that brings to mind souring dairy products. The body flavour is almost entirely absent, finishing with an aftertaste that is so sour I wonder if I have accidentally ingested hairspray or air-freshener. The texture is smooth, but crashes headlong into that revolting aftertaste. The agonising aftertaste lingers in the mouth for several minutes, and even polluted my attempts to enjoy a snack afterwards. Generally whole, in a range of sizes, with quite a few unfermented leaves. Plus, a tea fruit - as shown in the left of the photograph! This tea gives me the impression, from its dampness and "offness", that it was left wet for too long in the factory, without proper insulation to promote the composting/fermentation process. I am trying hard to remove the unpleasant aftertaste from clinging to my cheeks and throat. This tea is sincerely and genuinely offensive. Decent. Dark, with some chocolate-hued tips, with plenty of smaller leaves used. There are many bright white flecks on the leaves, indicating excessive dampness - I rely on the double-rinse to neutralise the unfriendly components. Almost fishy in the lid- and leaf-scent. Sticky-sweet aroma, which is absolutely constant and unbudging throughout the infusions. No real chaqi, with a tangy finish - or is that the enduring curse of Sample A? 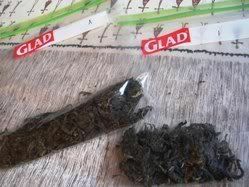 This tea stays steady as a rock, with its mild, sweet flavour and absence of chayun [sensation]. It feels as if there is little to examine here. The colour is pleasant, at least. 2-3cm segments of twisted leaves, with some smaller, greener leaves. 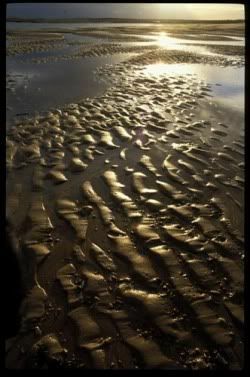 A constant body taste of sweetness, but almost nothing else - no chayun, no chaqi, no patience, no presence in the nose. Restaurant tea. Tiny little curls, with a lot of tips visible - as you can see. A quiet, sweet aroma is detectable. The soup is a smooth orange with a green-yellow rim, usually seen in tippy hongcha - I suppose that the tips are providing a similar effect here. There is a tang, as if not entirely fermented. Rather one-dimensional in its standard shupu flavour, and yet there is something of note here: the chaqi flushes my ears and neck, and brings perspiration to my forehead. The soup is effervescent on my tongue, and noticeably cooling (perhaps from the greener leaves observed earlier). The whole tea feels average in the flavour, and yet something greater in the sensations experienced. Tiny little choppings of small leaves and tips, which explains its refusal to provide flavour past the third infusion. A pleasant aroma of dates and prunes is about the wet leaves. It is as if one reads three essays, all rushed and average in their immediate quality, and yet one shows sign of a greater potential, a certain quality that makes its author seem more capable than the offering provided. This tea is that latter essay - it is not above average, and yet it has markings of quality that could be developed by a canny producer. I feel rather favourably inclined to this tea, as to a bad student in whom one can see shining intelligence and a vivid enthusiasm. Having returned late, this evening, a brief of a tea that typically doesn't require too much attention is in order: an Oriental Beauty. This is from TeaCuppa - thanks to Lisa. Baihao [white tip] or Dongfangmeiren [Oriental Beauty], I'm sticking with its actual name in the English (as before). Whole and small. Some fully oxidised, some very green, some tan-brown, some pure, white tips. Quite a display, as one would hope from Oriental Beauty. The aroma is quiet, and is the typical malty, wild-flower aroma. You'll notice that this tea only ran for three infusions. The opening infusion is where the action is: it's quite an acrobatic tea. The beidixiang is a definite, unmistakeable cinnamon current-bun, much like the Xinzhu County OB from Teamasters. 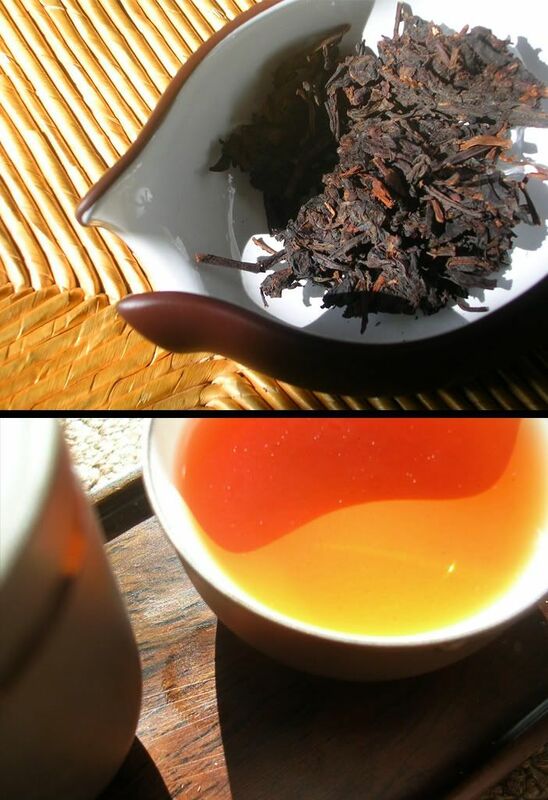 A tangible flip occurs after a few breaths into a deep, sour (and pleasant) lengxiang. It's a hard-working aroma. The initial flavour was similar exerting: very sweet in the foretaste, with no real body, but finishing in a striking huigan of cinnamon currant-buns. The texture was smooth, from the tippiness, but there was no observable chaqi, or any remarkable patience. After the first infusion, the earlier acrobatic qualities had clearly exhausted the tea, as it was simple hongcha by the third infusion (though not unpleasant). Amazing. As they fell out into the chahe, I did a "double take" - are these leaves really two-tip-and-a-bud? Rather a surprise. The entire tea is from a particularly good grade. Given the clearly good grade of leaf, it was a real surprise that this tea showed so little endurance. In the first infusion, it was dramatic and pleasing (though lacked body). This rapidly decreased in the second, then vanished by the third. Good grief, British academics drink hard. My usual relief at returning home is this time further compounded by my tiredness after several nights of punishment at the hands of some rather heavy-drinking senior professors. I should add that there's nothing big or impressive about drinking alcohol, but it's just the unspoken law in academia - particularly if the conference is held in an out-of-the-way location. It's also the "great equaliser" - junior whelps like myself suddenly find themselves swapping (dodgy) stories with senior profs, both of whom no doubt rather wish they hadn't in the cold light of day. It's a great way to make good friends, but it does make you appreciate a good night's sleep at home afterwards. You'll excuse me if there's no tea review today - I slumped behind the tea-table and grabbed something familiar and enjoyable (Tieluohan from Houde), thoughts of tasting notes far from my mind. This dark, embracing tea is very welcome as the late-evening skies gradually dim. In coming days, stay tuned for further TeaCuppa reviews, more from Houde, and a very special guest tasting of samples from MarshalN (thanks!). I've had word from Xiaomao - she's bought eight teapots from Maliandao, in Beijing. Eight! I'm going to have to think hard to find some categories of tea for them... suggestions welcome! So far we have: nongxiang and qingxiang wulong pots, hongcha, young shengpu, old shengpu, shupu, and then gaiwan for everything else. Given that I'm still at the conference, here's a review from just before I left, back when I had access to proper teaware. Having said that, the water up here is legendary in England for its purity, and so I look forward to trying it out a little more with the small teapot in my room. Today, it's a rougui [cinnamon] wulong, from TeaCuppa - thanks, Lisa. Long and twisted, with some obvious green to be seen amongst the richer chocolate-browns. 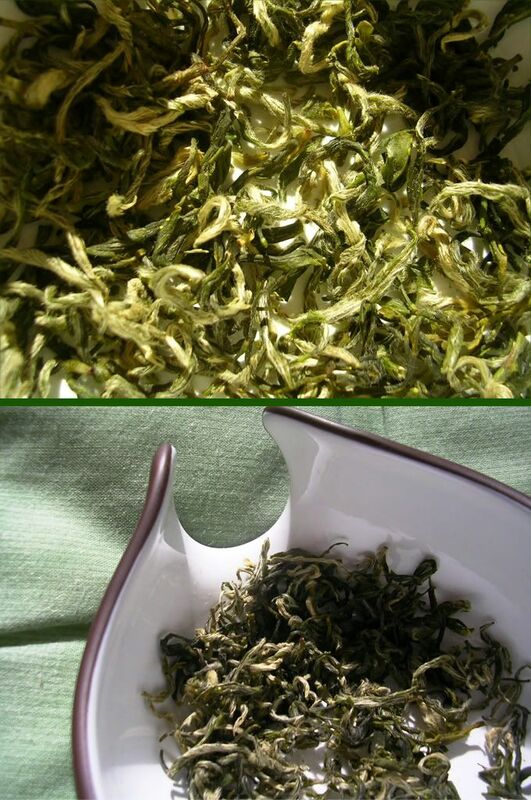 A sweet, buttery aroma of signature Mainland wulong leaves - robust as ever. Radiant orange soup, with a little tip-fur. It has been rather a while since I had a tea quite as aromatic as this: it is the classically technical progression from brief beidixiang, to longer mid-scent, to the final enduring lengxiang. The beidixiang is sweet melon, becoming creamy butter after one breath, then settling into the rich caramel lengxiang. Really rather splendid, and a textbook case for learning the aroma process in a wenxiangbei. The flavour is unexpectedly fruity, which should not have come as a surprise given the green hue of some of the dry leaves. This is not dissimilar to a dancong, with a robust wulong character of Wuyi. The oxidised fruits in the foretaste have good patience, and eventually hand over to a satisfying, sweet huigan. Lo and behold, sitting in the nose while the huigan is doing its business, is the cinnamon. At least it's worthy of its name. This tea didn't last long, but was really rather accomplished for the first few infusions. After that, it settled down into the reassuring character of "tea". The roast is particularly well-integrated into the flavour, happily not dominating the proceedings as it is wont to do in lesser teas. A hand-picked assortment from 2cm to 5cm, nearly all segmented. Bright red edges reveal the source of the fruitiness. Short, but very pleasant. 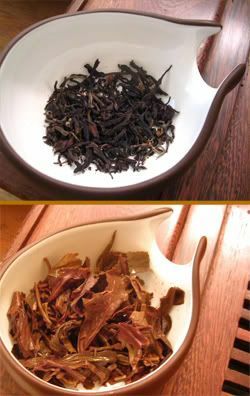 This is a great tea to observe the three-stage process in the wenxiangbei, consisting of three distinct and obvious stages. I'm writing this from another conference. Given that I'm in a technical discipline, and I know several readers also have first-hand experience here, most conferences that I attend are in largely unpleasant places - mathematics and engineering faculties of universities, Governmental research departments, industrial venues. Severe architecture, unpleasant facilities... bad tea. This is par for the course. It's set in lovely grounds, in a tiny old-fashioned village, out in the middle of nowhere, somewhere in the north of England (Cheshire). Sadly, the tea's still no good - but I have brought more than enough to see me through. I'm happy to see a pleasant 15cl teapot on my dressing table. As promised in my last post, it's time to cast a critical taste-bud over the Menghai Shuilanyin [water blue label], apparently so called due to the ink used in the neifei (to which I don't have access, as this is but a sample). Guang has dry-stored this since 2004, in Houston. 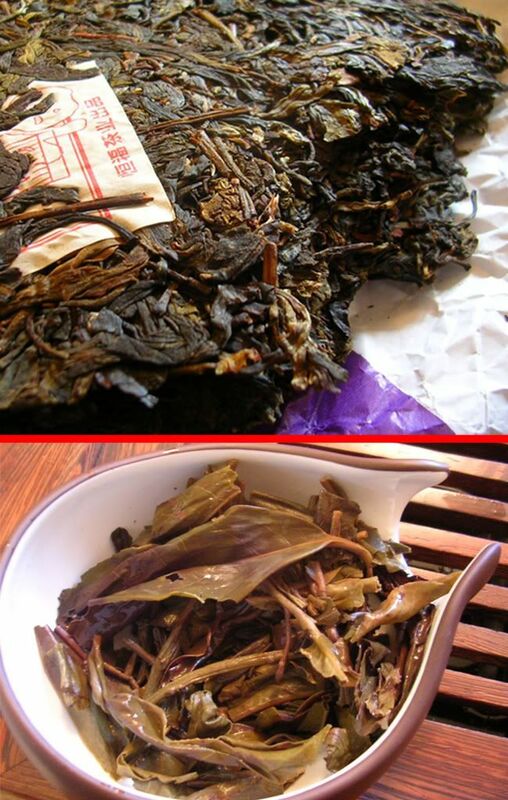 This bing is, apparently, a "special production" of Menghai, and so promises a higher selection of leaf than the usual Menghai bulk-purchase of leaves. Rich chocolate, mixed with black. Rather tippy, testament to the "special production" status. Somewhat wet-stored in its aroma. You'll note a dusting of white flecks in the photograph; Guang's dry storage has done rather well in neutralising the "wet-storage" aroma to some degree, but it is still present. Note the large number of infusions (for one person - I'm drinking all this alone at the moment, whereas usually there would be two of us to consume the volume of tea and thus reach higher numbers of infusion). This indicates that the tea went down rather well. First of all, I should confess: after the fourth infusion (20s), I went to bed and left the tea sitting in the pot overnight. After resuming at the fifth infusion (30s), the tea had changed character a little - in a highly pleasant way. I'll describe each session briefly. Initially, the lid-scent was damp mushroom, and I was immediately reminded of my old friend, the 1998 Menghai "Peacock" tuocha, and its cousin, the 1998 Menghai Dayi tuocha. Clearly a Menghai, right from the aroma of the lid. The leaves are thick and medicinal in aroma, with a hint of their youth remaining. The soup is very thick, and a pleasingly rich orange colour, as may be seen from the photograph. The feeling in the mouth is excellent, providing plenty of smooth tea-oil. There is a wet-stored flavour, which I find pleasant, and throughout it is the constant tone of its youth, that mellowed and yet obvious sweet-bitterness from foretaste to aftertaste. This definitely seems to be in an enjoyable stage of middle-agedness. The qi is rather vivid, causing flushing throughout my limbs, but this has the misfortune of having to compare with immense qi from the 60s GYG from yesterday. Coming back the next day, the wenxiangbei was filled with particularly sweet, creamy vanilla. It was genuinely lovely. Was this a function of leaving it for ten hours, overnight? Would the tea have taken on this characteristic anyway? These are questions for a subsequent tasting. That vanilla then proved evident throughout the flavour. The good huigan, the nasal "wet storage", the constant tone of "youth" were all surrounded by that very pleasant vanilla-cream. On the whole, small and young. However, there were a few real bruisers in there, clearly taken from absolutely whopping leaves, as may be seen in the above photograph. It's an interesting blend. It's very definitely not the usual Menghai mulch. The youth is present, but it is riding through an undergrowth that is already becoming rich and deep. It's smooth - the youth is just that constant tone, rather than any aggravating sensation in the throat. Unlike many ten-year-olds, this has a decent basis of rich, deep flavours. My plan for this week-end was simple: write a magazine article, complete some work for my supervisor, learn some new choir music. Then, the College porter presented me with another large parcel containing (you guessed it) tea. So much for my plans! There's something wonderful about Sundays. I remember, as an undergrad, the week-ends didn't really mean that much to me - they were largely similar to the weekdays. Years later, and the week-ends are oases of time, and Sunday is the sweetest of all. This morning, standing in the sunshine as I stepped outside the College after Mass, I looked up and down the road and watched all of the other College doors opening as the Sunday Service in each one finished at about the same time. Our neighbours to the south, Blackfriars, look particularly impressive, being bona fide monks, in full black robes. It's interesting to see Dominican monks rubbing shoulders with a modern city - they look removed from a past time. And so, today's tea. Also, removed from a past time, this sample arrived with us courtesy of Houde. Guang notes that the 60s cakes were partially cooked (as with shupu), hence their less exorbitant pricing (though a bing still goes for $1150). 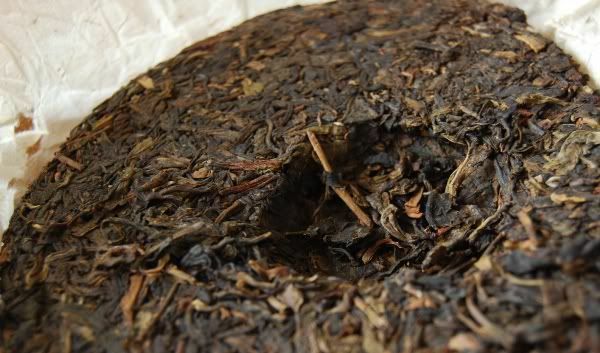 Unlike the 70s versions, these leaves are all from Yunnan, as Guangzhou was the sole distributor for 60s cakes under the planned economy of the PRC at the time. A mixture of truly black leaves with some of a dark chocolate shade. There are some yellow leaves mixed in, which is usually not a good thing, though even these have become dark through the decades. Looking at the photograph, you can see the leaves appear rather primitive and messy, being thoroughly chopped. White dusting and a damp aroma are clear evidence of wet storage. The initial impression is a basso profundo note of rich, old libraries. The compression is fairly loose, and so avoids the extremes of hindered aging through tight compression (c.f. 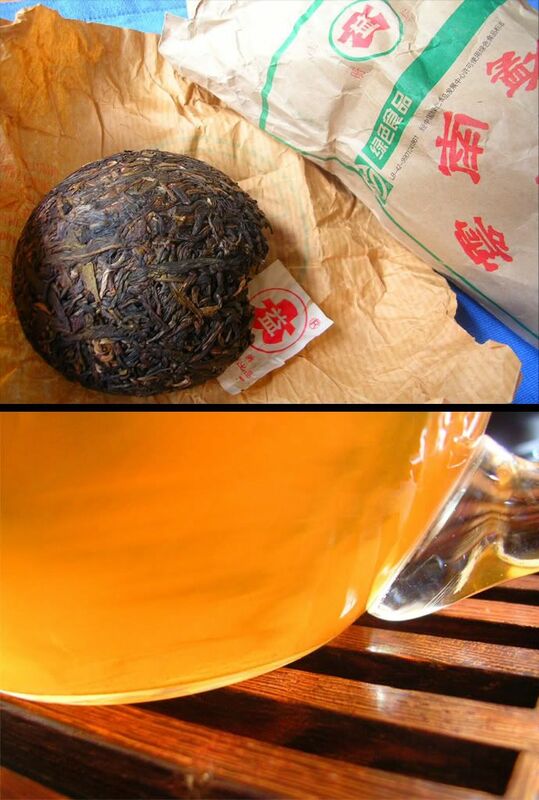 1980s Xiaguan Zhubao Tuocha), and simple exhaustion of flavour due to lack of compression (c.f. 1960s Gaoligong Maocha). Pure, orange soup which darkens to a rich orange with later infusions, but never becomes anything darker - I was half-anticipating something rather burgundy. 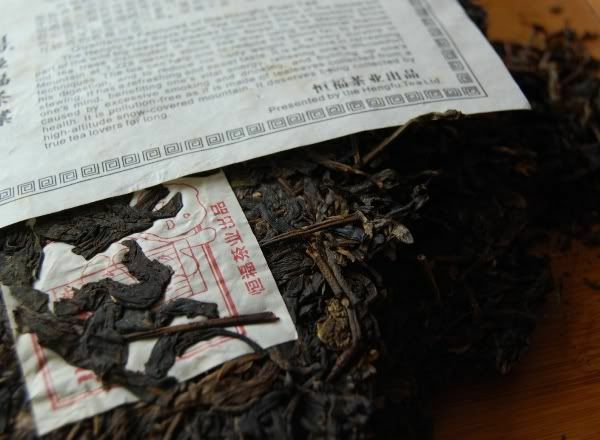 The wenxiangbei reveals little in the way of scent, initially, with a long vanilla aroma becoming evident later. The lid-scent is quite "alkaline", and contrasts with the deep, rich plum scent of the leaves - opening the pot reveals an aroma which smells as if a deep pit has just been opened. 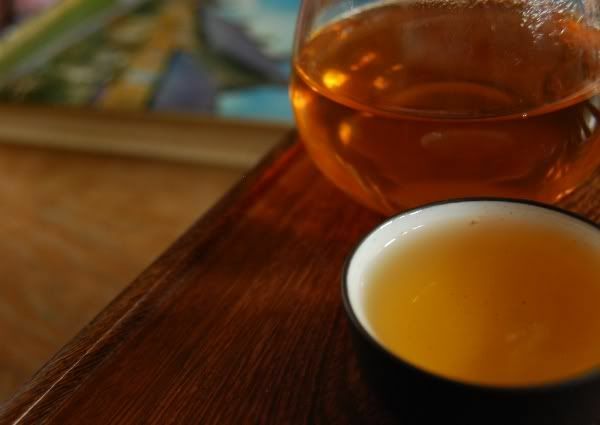 The texture of the tea is marvellous, and is the first impression from the pinmingbei: it is so very smooth - everything it touches is coated in a fresh oil. Now, then, the flavour. Truth be told, this tea isn't particularly special in its flavour. Bear with me through this potential blasphemy, for it seems that this is not the real purpose of this tea. The flavour itself is wonderfully smooth, surely a testament to the decades, but is not captivating in any rich and profound fashion. Yes, it is very appealing, but it is mainly characterised by a long, slow sandalwood taste, with a gentle "bookishness" lingering in the nose. The patience is excellent, as the progression to the throat is gradual and smooth. The real purpose of this tea seems to be the chaqi. It truly does feel like a tonic, a magical potion, a draught of some rare elixir. It is a qi delivery vehicle (or stimulant, if you define qi as being already present in the body). Even after the first cup, my body was buzzing and swimming. The physiological response is absolutely striking. It's so clear that even Western science should have no problem in detecting it, even if unable to explain it. Putting aside the old debate about qi, and concentrating on what I observe, it's fascinating to see how my body reacts to even the smallest amounts of this substance. Drinking this tea, it is possible to understand where the interesting theories underpinning Traditional Chinese Medicine might have originated. Shengpu is considered a "cooling" energy - drinking this tea is like taking freshly-plucked mint onto the tongue. There is a distinct and obvious drop in temperature on the surface of the tongue, toothpaste-style. After three infusions, I have to pause - my head is giddy and I feel quite tipsy. Putting aside the pot, I head out to the garden for some taijijian [t'ai-chi sword], wondering what the effect of the qi might be on my form. This pattern repeated itself until the end of the day, taking three infusions at a time, and then resting for some other activity. The aroma in the wenxiangbei really came alive in the fourth infusion, being a camphor initial scent, quickly becoming the previous vanilla, and then settling into a long lengxiang of dark, low sugar scents. At the same time, the flavour developed into something more tasty, still sandalwood, with the aroma of dark fruits sitting in the nose. 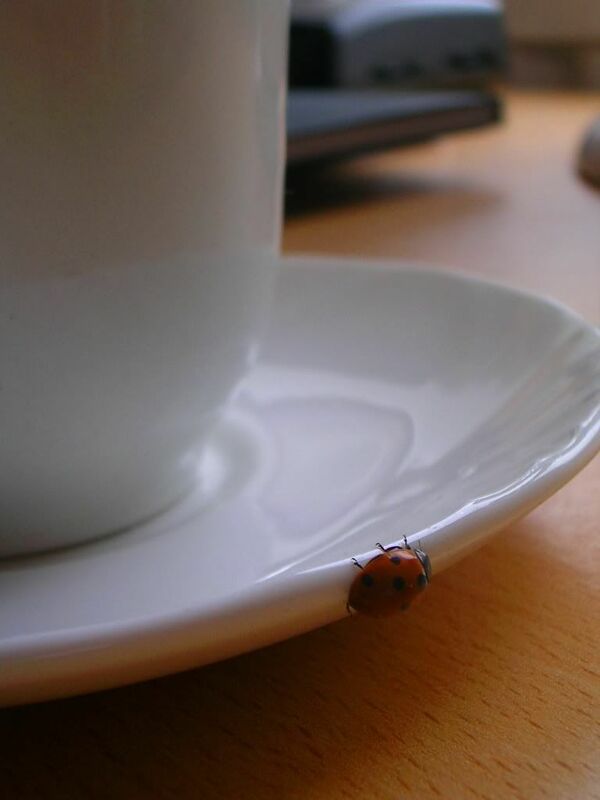 The tea opened like a butterfly. Unremarkable, looking for all the world like a particularly diced shupu, as you can see for yourself. I cannot honestly say that I like this tea for its flavour - even at its peak, after the fourth infusion, it was still just smoothly pleasant, rather than being outrageously delicious. The purpose of this tea seems to be in the qi, which is so pronounced that it feels like some beautiful, harmonious tonic - I initially wrote "narcotic", but narcotics could ever be described as harmonious. I don't believe that this is worth spending vast sums of money to obtain. I had entertained the idle ambition of buying a bing prior to tasting, but the sample has convinced me otherwise - though the qi really is fascinating, it is not quite satisfying in its flavour, which is largely quiet and familiar, though always smooth. There is some aggravation in the throat, and it feels generally high and a touch simple in its presentation. The price is clearly a function of its rarity, and I believe not in line with its actual merits - good though it is. I walk alone, in the University Park behind our house. 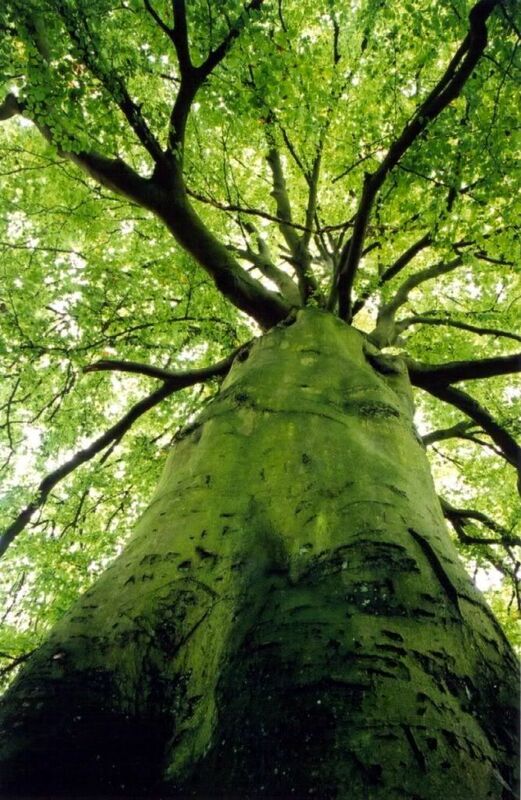 The tall trees are a green cathedral, its vaulted ceiling filled with song from a hidden choir of birds. The warm, humid air is heavy with the incense of cut grass and cow parsley. Where the sun penetrates the dense canopy of branches, yellow butterflies cross the sunbeams. Everywhere, stirred by the breeze, a congregation of drifting cotton-cloud seeds. I whisper a prayer of thanks in this, His eternal Church. This verdant little tea fits well with my mood, after my walk. 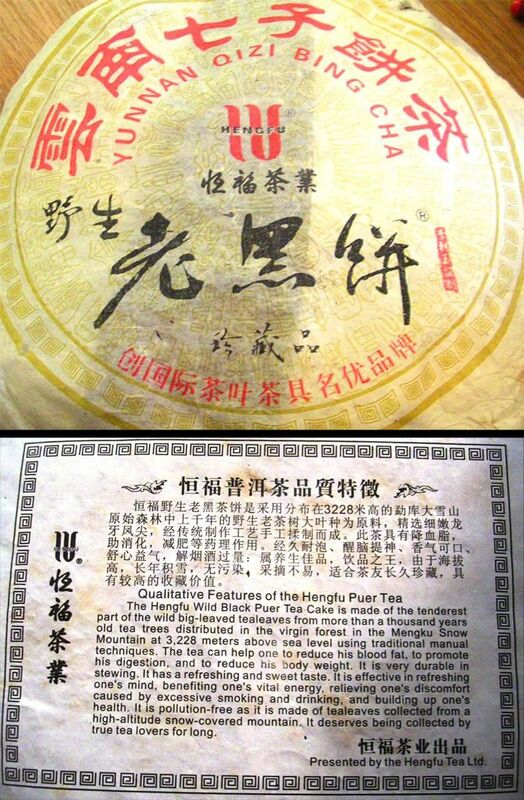 A sample from TeaCuppa, this is listed as "Premium Organic", apparently from the Dongting region itself, near Taihu [Lake Tai]. Biluochun always reminds me of a beautiful painting of Taihu filling an entire wall of an old Chinese restaurant that Xiaomao and I used to enjoy when in Manchester. The parents of a friend gave us a beautiful biluochun (bought from their home in Suzhou), which has always been the standard against all other of that type are compared. This is a tough standard, as it was a truly beautiful tea. Will this 2007 organic leaf reach those heady heights? Observe for yourself. This is one of those teas that stopped the clocks and held my gaze with its very real beauty. It is pretty, even for biluochun, one of the most visually appealing teas to my taste. It is a mixture of whole, rich green twists and pure silver whole tips. It is a green-and-white treat. My first indication that something might be amiss is the aroma of the leaves: it is not just smoke, but very distinctly the acrid smoke of cigarettes. Neither Xiaomao or I smoke, but we are intimately familiar with the aroma, and this is it. Is it the chahe? I removed some more leaves from the bag, placing them in the palm of my hand. Still I sense smoke. It is vegetal, and definitely part of the leaf-scent, but clearly smoke. 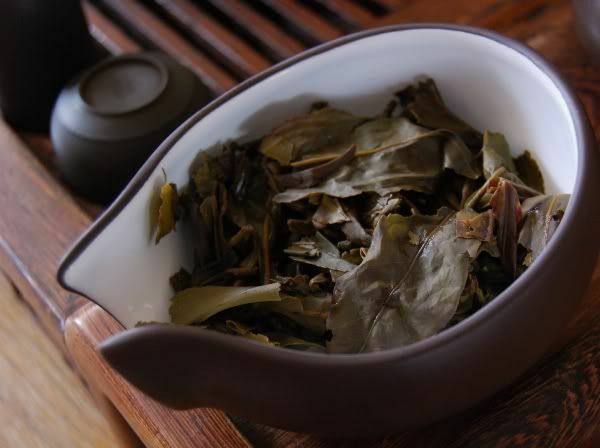 My heart still filled with hopes for this beautiful leaf, I introduce the leaf to the damp depths of the cleaned gaiwan, hoping for the signature biluochun aroma ("barbecued corn", as Xiaomao puts it), but there is none. I feel myself raise an eyebrow. Something is most definitely amiss. The colour is that of lime cordial: a light jade. Where is the definition in the colour? What does this bode for the character of the tea? Suspicions are further aroused with an absence of beidixiang, though a lovely candy lengxiang quickly arrives. The lack of patience in the aroma could suggest similar in the flavour. Courtesy of the tip-fur, it is a smooth brew, feeling very fine on the lips and tongue. The fore-flavour is the unmistakable fishiness of sencha. I raise my eyebrow once more. A note of smokiness, as noted in the dry leaves. The flavour is rapid in its progress to the throat, as if fleeing, ending in a gentle sweetcorn taste intertwined with that rather unwelcome fishy guest. Amusingly, the lid-scent is that tell-tale scent of Chinese supermarkets the world over: the durian fruit - heavy and deadly, to those that know it. Plenty of tips, but the mixture grade of basis leaves is larger and torn at the edges - is it machine picked? The leaves lack colour, being very pale. A leaf that promised much, but ultimately did not reach my tough standards for biluochun. It appears truly beautiful, and yet carries neither the complexity of aroma nor the appealing progression of flavour that I have come to love in biluochun. I could not tell if this were biluochun were I drinking it "blind". It could be the mixture grade of larger, torn leaf that is letting this tea down, giving it a smokiness and fishiness where one would hope for signature biluochun. I praise the organic farming standards employed for this, but the result is not to my liking. Concerned that my conclusions might be the result of chance, and eager to give this tea a fair showing, I spent a second session with this in my office, and reached a similar outcome. Revisiting the 1960s Gaoligongshan shengpu, I have added further notes to the end of the review. Following the original tasting, TeaCuppa were kind enough to send a second sample, this time sealed in an air-tight foil bag [many thanks]. The tea looks very similar, being larger-leaf than one might expect from a biluochun, but this time smells pungently of rich maofeng (much like another TeaCuppa tea, the 2005 Banzhang Maocha). The soup is pale throughout. Initial infusions taste specifically of the rich, grape-like maofeng character that we noted in the aroma. Lei passes through on her way to her laboratory, and quickly grabs a cup in passing: "This doesn't taste much like biluochun!" The final infusion sees a touch of the rich, almost "barbecued corn" that one might expect from biluochun, but it remains low. The overall character is decent, if quite timid. I directly compared this with some of the top-grade biluochun Lei recently brought back from her hometown, and the difference is quite pronounced. 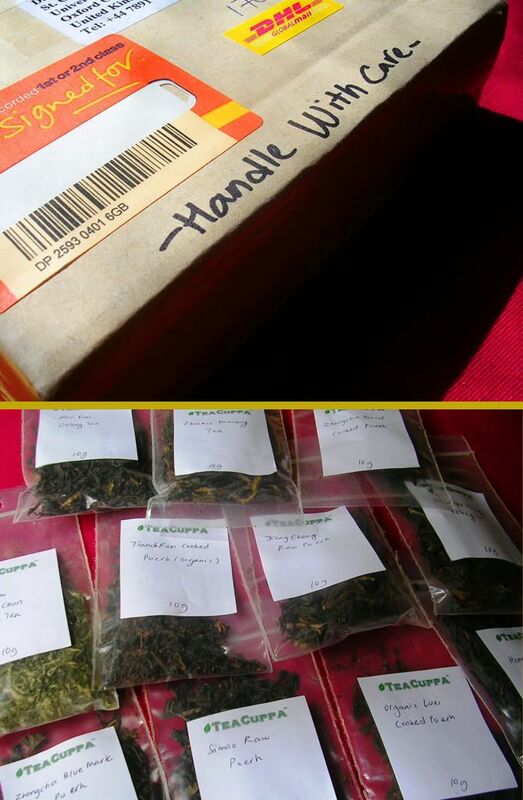 This morning's post brought with it a welcome package: samples from TeaCuppa - thanks, Lisa. These were apparently posted about a week prior to the samples for the Six Pu'er Tasting Event, and so they should reach their destinations soon. Don't look too closely at the photograph, as the samples shown are labelled with their actual names, rather than being anonymised for the tasting event! When you do receive your samples, don't worry too much about being able to determine which is which - I imagine that there are few, if any, folk familiar enough to be able to discern between the younger pu'er. The emphasis here is on collecting what you observe about the samples, and just generally having a bit of fun in the process. We might even learn something. With one arrival by post, another departure: Xiaomao has just caught her flight out to China, and I am already feeling the loss of her company for the month that she will be abroad. Sitting down and performing gongfucha today further emphasised her absence, as it something that we usually enjoy together. On the bright side, I don't need to shave for a month(*). So, then, the Milanxiang [honey orchid fragrance] Dancong. I've warned Lisa that I plan to be objective in my assessment of these samples, recalling the recommendation of my Yijing consultation to do so. No one wants to read a biased review. Let's cast a fair eye over this tea, well-suited as it is in its cheery and light character to pushing aside the gloom of an English rainy day. Having not enjoyed a good tea for several days, this sample does find itself already at an advantage, in that I am looking for something enjoyable, and have a clear, anxious palate. Drinking teabag Assam has been my fare for the past few days, having been on research trips away from home each day - engineers apparently have an appropriately practical approach to tea. Pretty, as you can see. Long, twisted, and ranging in shades of brown from dark to light, with some greens evident. As we wait for the water, while I write this, the bewitching aroma radiates from the chahe: cocoa and sweet creaminess. This tea really does catch me in a good mood. Immediate and obvious lychee in the beidixiang, which lasts just one breath, before becoming a weak lengxiang of cooked sugar. The progression is rapid, perhaps indicating a lack of patience in the leaf. The soup is pale: peach, tending towards green. This darkens to orange past the third infusion. Intense fruits in the thin brew, becoming a gentle honey in the finish. It is light - not one for the hardened chaqi addict (you know who you are). Quite pleasant on the lips, with a decent huigan. The feeling is smooth, with some oil on the lips. This is a tangy, sour, and "high" tea. It is not well-suited to the dark, buttery depths of our nongxiang pot, which pleases me: justification to buy new pots is always welcome. As always, this tea is making me extremely hungry. Xiaomao and I are rather sensitive to stimulants of any kind, and tea invariably makes us ravenously peckish, even if we've just eaten. The sour, fruity, honey aspect gives way to the power of sour tea by the fourth infusion - which I actually rather enjoy. I've never been a big fan of ballet, which is what the early infusions of dancong bring to mind. I prefer the heavy, bellowing opera that this tea settles into. Very green, as you can see from the photograph. There is little evidence of roasting, and only a brown-red overall hint of their oxidation. A very sweet scent of peaches is about the leaves, even at the end. Friendly and light, with a well-integrated set of honey and lychee flavours, about which a tanginess of tea-flavour plays which takes over in later infusions. Not an overtly special tea, but decent and balanced. In a previous article, we bandied around the idea of meeting up for a tea session, somewhere in the UK. I remember that VL and Iwii were interested - Iwii, could you please e-mail me? I don't have your address! It's hobbesoxon'AT'googlemail'DOT'com, if you'd be so kind. A conundrum, this fellow - quite a riddle indeed. Allow me to give you the background to the case. 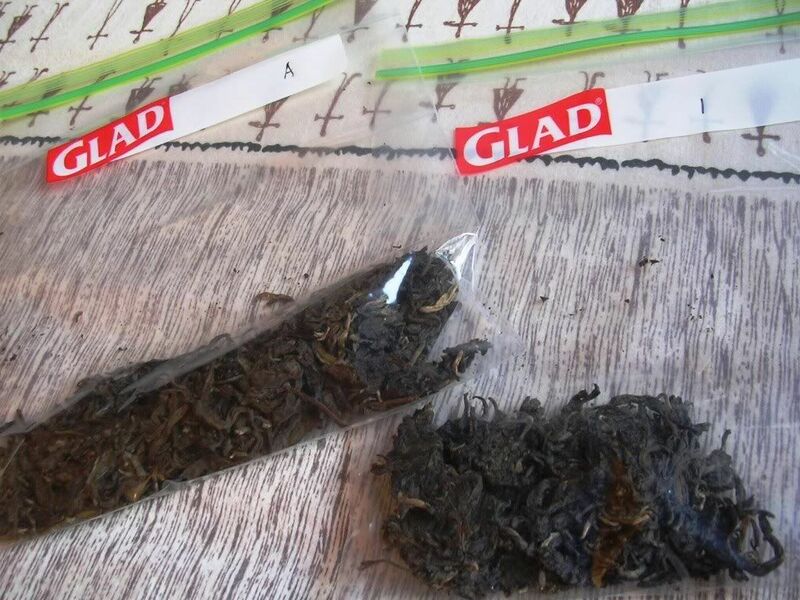 This is a bing obtained remotely, ordered by 'phone, in which we took a chance on a vendor (in Sichuan) who has provided us with good tea in the past when we ordered from him in person. We specified the general parameters of what we were after: good tea, with 5-10 years of aging, avoiding the usual big-brand factories such as Menghai and Xiaguan. Our thinking ran: if he replies with interesting tea, then perhaps we'll order again; if he replies with something flagrantly unpleasant, then we'll consign him to the history books. The jury is still deciding which of those two outcomes has occurred. Let's examine the facts. The tea is from the Jingmai region, with "Ruyi" referring to "As You Like It", or thereabouts. It's wrapped in a hand-written light paper. The vendor regarded this as unusually good, saying that it was a "special order". The wrapper claims to be "gu cha" [ancient tea], and is marked 2000 - as you can see. I take all this with a pinch of salt, of course. This cake is very loosely compressed; there is almost nothing holding it together except goodwill. This makes it easy to separate into individual leaves without damage and, perhaps, aids the aging process. They are dark, long, and very fruity - this smells... well, it smells of hongcha. "Alarm bells are ringing, Winston." Medium orange soup, which is very clean. A light aroma, of mild, earthy scents. Not unlike... hongcha. The feeling on the tongue is particularly delicious - it is smooth, and coats the tongue well. There is a distinct hongcha-esque sourness and tartness in the huigan and aftertaste. Later infusions give the floral, leathery scents of hongcha in the wenxiangbei. It is fresh, and feels quite effervescent in the mouth. For some reason, it fits rather well with Purcell's "Dido and Aeneas", which matches my semi-Baroque tastes. Apparently Purcell only lived 36 years, which explains the lack of output. This tea is similarly baroque, being intricate and dark - perhaps a little too fussy. Big and red. They do look pleasant, as you can see for yourself. All sizes are represented, from tips to 4cm main-branch leaves. Note the redness. If it looks like hongcha, smells like hongcha, and tastes like hongcha... then it's hongcha. The leaves don't appear (in structure) to be what one would associate with hongcha, but even the bing itself gives the game away. 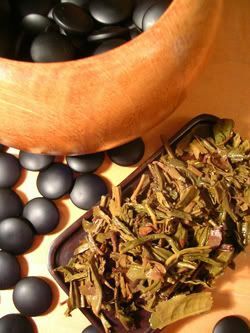 It is big, smooth and pleasant in a way that hongcha tends not to be, particularly the Dianhong that originates from Yunnan. It could be that it has just been allowed to oxidise sufficiently to give it that hongcha character. Judging the tea on its own merits, it is good - fine feeling, good patience, enjoyable surrounding flavours. This gives the jury some hesitancy in their decision, but the decision is inevitable: this isn't very much like pu'er, and suspicion rests on the vendor - not a good sign for his future chances of getting custom from us. I shall list it under "shengpu" in the Index - but its shengpu status is far from certain. Regular readers may recall my penchant for the Tang Dynasty poet, Li Bai, the patron scribe of Daoists, oenophiles, and Daoist oenophiles. I quote from "The Road to Shu is Hard". The Kingdom of Shu is centred on modern-day Chengdu, Sichuan Province. Sir, from this journey to the West, will you return someday? How can you hope to climb the crags along this fearful way? Leaning, I stare into the west and utter a long sigh. The road to Shu is indeed hard, but climbing to the sky is much more practical than in Li Bai's time due to substantial improvements in air-travel links to the southwest. Today's tea comes from a trip to the Kingdom of Shu, though I have a niggling suspicion that it's not quite from the Tang Dynasty. Somewhere in the endless suburbs of Chengdu lies the city's large tea-market, a permanent fixture of tea stores, all frantically buying one another's tea and, on occasion, deigning to sell some to the general public. Observe the neipiao. Like most Hengfu products, it is, at least, professionally attired and presented. The English is almost correct, too, which is a bit of a treat. Among the usual claims to be a panacea, it indicates that this bing is derived from Daxueshan [big snow-mountain] in Mengku region. They have rather precisely estimated the height of the plantation to be 3228m above sea level, but I suspect that this may actually be 3227m, or even as low as 3226m. Never trust what you read. I like to think of myself as "true tea lovers" and so shall attempt to "collect this tea for long" - but it's tricky, because it turns out to be rather tasty, and we're at least half-way through it already. Desirable. Long and thick, with good integrity. Sociably loose compression, being easily pried apart into its constituent leaves without damage. The major impression here is the aroma: it's strong, it's rich, and it's similar in its tobacco style to the celebrity 2001 Menghai Yiwu. When the dry leaves drop into the damp pot, these aromas fill the entire room. The leaves look pretty, do they not? Light orange soup, becoming richly orange in later infusions. Very clean, with a long, enduring scent of fresh corn. The lengxiang is a heavy molasses. "Syrupy." It has some good age on it already, which is interesting given its youth. The ku of youth is evident, being powerful throughout the mouth, but it isn't raw or unpleasant. It is very rounded and bass, not dissimilar in flavour to the 2001 Menghai with its padding of leathery and tobacco notes. "Very much my cup of tea; like a woman my age, not too old, not too young." The feeling in the mouth is smooth and oily, with good patience. The huigan is robust and enjoyable. Large, whole, and very strong. Some red edges testify to a little oxidation. Rather satisfying to handle. It's been over two years since I tried this cake, and it holds a rather special place in our collection. 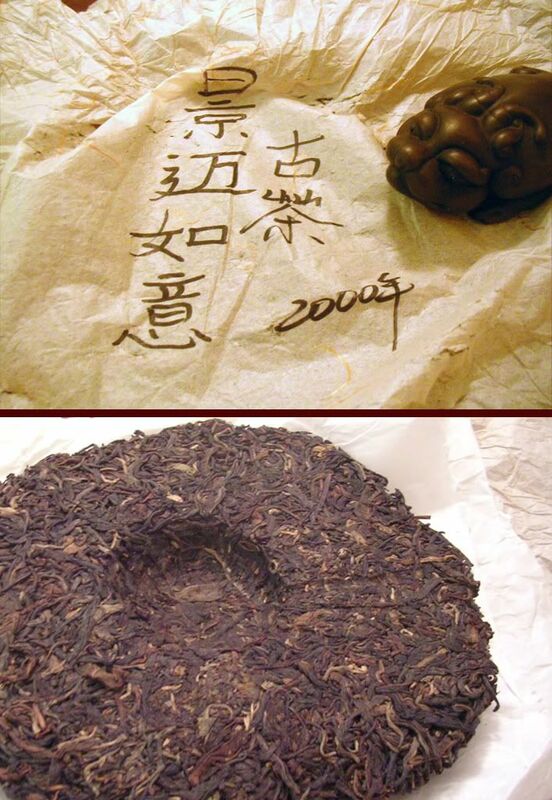 As I wrote about above, we bought this cake a million years ago in Chengdu, and it has been aging with us. I treat this cake as an index of the effectiveness of our storage, it being the cake that we've stored the longest. I can't wait to try it again - fingers crossed! Things are darker. What was previously the dark-green colour of youth is now somewhat rusty (pictured below). I didn't previously note the large proportion of huangpian [yellow flakes] in the blend. It is mostly made of large fragments of good leaves, and it has a dark, woody aroma. I find this extremely encouraging! It's definitely moving in the right direction. I think back at the price I paid for this and chuckle. I was totally gouged by the seller back then. Expensive tuition! The soup is dark, having become a lower, chunkier orange than I remember. The biggest change in this cake is that it has developed strong overtones of wood. The body has become slightly sweeter, but plenty of challenge remains in the throat. It is neither young nor old, and I can see why Marshaln considers them difficult to drink, being neither fresh and zesty, nor aged and reverend. I must confess to enjoying them, however: it has the challenge of youth, which I adore, and comes with strong tones of wood, hinting at its future. My tastes have always been fairly contrary! Lei makes approving sounds as she grabs a cup in passing. It's great to be back. I say that every time, and every time it's true. After the May Ball (congratulations to my cousin on squeezing through our lavatory window in a dinner jacket and bow tie, pre-dawn, with a 6-foot drop beneath it), we headed to Wells-next-the-Sea, pictured right - a remote, uncompromising, but ultimately very pretty town on the east coast of England. Tea consumption was limited to great drafts of Assam with "traditional English breakfasts", synonymous world-wide with immense quantities of bacon, sausage, and black ("blood") pudding. Delicious. It seems that we're not all that distant from our Saxon ancestors, after all. i) Lisa @ TeaCuppa e-mailed me today to say that the samples were posted (on Monday, 7 May) to those joining the tea-tasting exercise. Hopefully, this means that you should have them either this week, or next week, depending on your location. Perhaps LZ and John, being in Mainland China, even have theirs already. ii) Carla and Bill: I've just posted various samples to you (unrelated to the tasting event), so do keep an eye on your mailboxes. And there endeth the notices. Let's drink some tea. Today's two shupu were samples from VL - thanks again, good sir. Laotongzhi refers to "old comrade", while the "gongbing" indicates "tribute to the Emperor" status. That last one is a little tricky to justify, given the marked absence of Empire for quite some time. In the following, the Yushan and Laotongzhi Gongbing are referred to as A and B, respectively, and appear upper and lower in accompanying photographs, respectively. The photograph is a touch uninspiring, but this is shupu after all - there's not a lot to see. A: matted dark- and mid-browns, in 2cm lengths. A sweet and really rather pleasant aroma, but nothing extraordinary - again, very much like most shupu. B: rust orange, very much like chuanhong. Decidedly standard shupu aroma. A: Rich and red, with good clarity. Well-balanced aroma carrying over from the dry leaves into the wenxiangbei - burnished sugar and treacle. This is a very decent opening flavour, with a malted texture - sweet and rich. It's decidedly pleasant - not great, but pleasant nonetheless. The aftertaste is enduring, with currants and sultanas. The leaves have the aroma of Chinese red dates. B: "sweet, almost like syrup". Thick muscavado sugar in the beidixiang. Something of fresh, sprouting beans in the flavour. "Very rounded, yet not very deep - no sharpness at all." The texture is soft for a shupu. The lid-scent is "like an old Chinese medicine shop". It's shupu - they're dark and standard, both of a generally small grade. Conclusions are hard to draw from this most homogeneous of genres. A: Sweet and gentle. It's not complex or wonderful, but it is enjoyable within its class. Inoffensive, and therefore not worth buying. B: A shallow treat. The better tea, but again not enough to actually warrant a purchase. 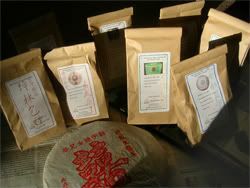 There is simply too much better tea out there to buy Haiwan 2005 shupu. VL has provided some accompanying notes for this pair of teas, drawing broadly similar conclusions, but observing something more noxious in the Yushan (A), which we may have avoided through being conservative. It's May Ball week-end, and so I'll be unable to post until Sunday/Monday. If you've not heard from me by Tuesday... send search-dogs, start with the river. This tea is a soldier, and has been in the pot all day - as I've popped in and out to various talks, I've taken successive infusions from it. Total elapsed period of consumption: 13.5 hours. A long time ago, I fell in love with the 98 Menghai "Peacock" tuocha, the review of which I'll dig out of my journal archives at some point. It was really fine, and nicely aged. This is broadly similar, being the "Dayi" [great benefit] brand from the same year, and it looks and tastes much like its stablemate. This is good news, because I've just bought 2 tubes of this, with 5 tuo in each tube, on the assumption that they would indeed be similar to the peacock that I love so much. They're from the 5000friend eBay store, apparently based in Yixing itself - usually known for an array of teapots (which have been the subject of numerous threads in the rec.food.drink.tea newsgroup). Finding these teas is becoming very difficult. Even just a year ago, they used to be available for $10/tuo - decidedly inexpensive. Now, they're hard to find at any price. The ones I've found from other vendors are $30/tuo - a tripling of its price in under one year. 5000friend was selling them at their original $10 price, and so I felt rather obliged to take a few for the cupboard. According to the tube, they are "jiaji" [first grade], and also bear the "Lu se shi pin" [green-colour food product] logo, which you can just about make out in the top photograph, in the green bar of text. This is a pseudo-organic label from Mainland China - though is uncontrolled, as far as I know. Dry leaves:Darkened brown, lighter tips, good leaf integrity. That familiar and welcome Menghai aroma: sweet, earthy. Sociably loose compression, unlike the horrific Xiaguan tuo from recent memory. In the chahe [tea lotus], the aroma is complex, satisfying, and mushroom-like. Yellow-orange soup, of a vivid hue, as may be seen above. Cloudy with tip-fur. Long, familiar Menghai beidixiang - so sweet and mushroom-dark. Great patience for an aroma, eventually changing into that lovely sticky-straw lengxiang. Smooth texture is the first impression, possibly from the tip-fur. A fine, oleaginous sensation throughout the mouth, with fine patience, before ending in a robust huigan. A touch of its youth about it still, but aged such that the rich background flavours are of similar amplitude to the youthful sweet-bitterness. The classical example of middle-aged tea, and very enjoyable. Sour notes sailing atop the flavour, from lips to throat. The chaqi is brisk, and really rather enervating. My mouth is left sour, my nose sweet, my cheeks and tongue delicately-oiled. Later infusions see a reduction in the smooth texture, presumably due to the decrease in tip-fur as the soup begins to clear. The youth of the tea also becomes apparent after the third infusion, by which point there is more potency than initially encountered. The youthful aspect of the tea cannot hide - the leaves are very green. A small grade has been used, quite possibly "jiaji". Significantly chopped. This needs more time, but is enjoyable and has potential. It feels roughly halfway through its middle-age, showing some depth of character, but with its hidden youth becoming evident in later infusions as the richness subsides. Great texture and huigan make this a welcome addition to the store-cupboard for future years. This sample comes courtesy of VL. It's a review from the archives, because I'm just about to finish this journal (number 24, interestingly enough), and this is one of the few unpublished reviews from it. So, then, is it really Zhengshan [proper mountain]? Directing your eye to the top photograph for a moment, behold what looks to be a rather pleasant pile of leaves. It's a little "modern Darjeeling", in that there is a fair mixture of dark and green - not a lot of consistency in the oxidation. Almost no compression whatsoever, which is absolutely fine by me. Mushroom aroma - rather decent, in fact, by nose. Not a lot of infusions, as you can tell, perhaps indicative of my lack of long-term interest in this tea. It's a thick yellow, very viscous indeed, with good clarity - a few hairs from the tips may be seen in the soup, for good measure. A long, strong aroma of sticky wood - the freshness of the leaves is apparent in this tea's presence in the wenxiangbei. It exhibits a curious set of flavours: low and broad, and quite smooth. Not overly interesting, but smooth. There is a decent tang in the finish, with a long-lasting sweetness. Xiaomao detects some smoke, but I cannot. 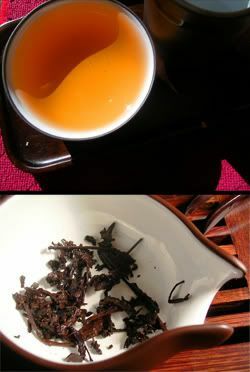 It's a quiet, non-committal tea, just showing signs of being well-integrated in what it does, without trying too hard. 1-2cm segments, hand-picked. Why chop them? An aging accelerant? I'd rather they were untampered. Consistent with 2-3 years of oxidation. Smooth, gentle - a fair enough tea for a warm afternoon with a book. It doesn't grab the attention, but putters along aimlessly by my side. Grain, sweetness, gentle straw, and that welcome tang to finish. Friendly, but not inspiring. I recall that this refers to the currents of evaporating vapour that were as trapped in the gongdaobei as was my rapt attention on following their slow revolutions. Addendum: after transcribing my notes, I found notes on this tea at the ever-excellent TeaLogic. It seems that we're of a like mind: "it's not right, but it's OK".